Electronic access control, used in combination with Digital Video Surveillance, dramatically improves security and is the most effective method of controlling access to your office or facility. 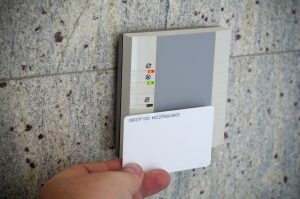 Inexpensive plastic access cards can be programmed to restrict access of specific areas to certain individuals while recording the time, date, and location of both authorized and unauthorized access attempts. These cards can also double as a form of photo-ID and again, are great for monitoring employee time and attendance, security patrols of the property, and limiting access to sensitive areas. Biometrics, such as hand or eye scanners, are also available to further elevate security at highly restricted sites.